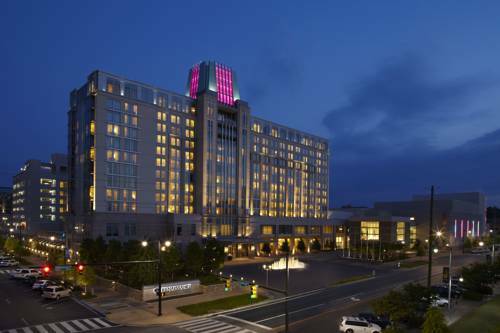 Enjoy both modern luxury and unparalleled convenience at the Renaissance Montgomery Hotel & Spa at the Convention Center. Whether you're visiting Alabama's capital for business or on vacation, you'll love our terrific downtown location, attached to the city's Convention Center and steps away from the Montgomery Performing Arts Centre. Stylish accommodations feature luxury bedding, complimentary Wi-Fi, and spa-like marble bathrooms. The House, our hotel restaurant, offers delicious Southern cuisine; additional amenities for your Montgomery visit include a 24-hour fitness center and roof top pool. Our hotel is the premier destination for meetings and events here in downtown Montgomery; we're attached to the Convention Center, making it easy to host a gathering for up to 7,000 guests. When your meeting is over, be sure to pamper yourself with a visit to our luxury spa. Head downtown and discover why the Renaissance Montgomery Hotel & Spa at the Convention Center is the most coveted address in Alabama. Sample fresh, Alabama-inspired dining at The House, our signature restaurant. Open for breakfast, lunch, and dinner, it's the ideal spot at which to start or end your day here in downtown Montgomery. Dine outdoors on the patio during the warmer months. Named after the historic Montgomery hotel and featuring craft cocktails, light dining, and live music, The Exchange is perfect for meeting friends or colleagues after a busy afternoon here in the heart of the city's downtown. "Hell is Hot Hot Hot." If the late W.C. Rice's stark Cross Garden folk art environment doesn't save you, there's no one to blame but yourself. Beloved mascot of a small town, Fred died in 2002 and is remembered with a nice tombstone. Defying the laws of gravity and common sense, vehicles appear to roll backwards up a hill. A classic commercial cave, featuring a biblical light and fountain show, a waterfall, and fish with normal eyesight. The "Cave Crawl Box" outside puts you through 200 feet of simulated cave crawling.